Yogis travel to Costa Rica from around the world to experience a place and time where the pura vida life is all-encompassing. Where the pulse of the natural world flows organically with our inner rhythm and where we connect with the peace and calm of an unhurried lifestyle. 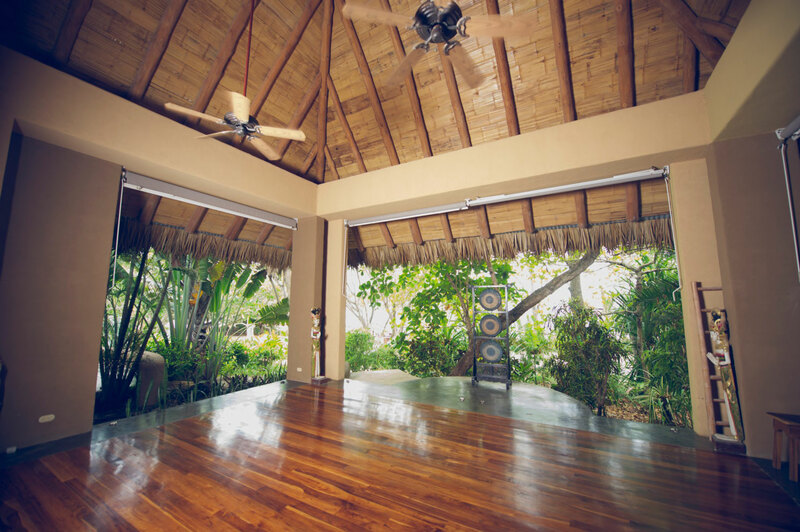 At Florblanca, the yoga shala is a centerpiece of our property. It is open-air, ocean-facing to bring the outside in and remind us that the practice of yoga exists both on and off the mat. When Kelly, a revered yoga teacher from Mission Yoga in Charleston, SC, brought a small group here for an intensive 6-day retreat, that reconnection with the natural world and re-awakening of our inner identity through yoga was exactly the experience she was looking for. It was 12 years ago and by chance that Kelly discovered the practice of yoga, and almost immediately she recognized the opportunity that revealed itself through the practice and, beyond that, through the philosophies and the lifestyle. At a time when she felt drastically off-course with the direction of her life, yoga was there with the opportunity to heal and to tap into her potential that she knew was waiting just beneath the surface. In a move from New Orleans to Charleston that left an acting career behind her and a sense of uncertainty in her future, Kelly was in danger of re-creating unhealthy patterns she had experienced earlier in her life. In Charleston, she was encouraged by a friend to try a yoga class, and after the savasana period of rest at the end of that first yoga class, Kelly recognized with acute clarity that she wanted to become a yoga teacher. She found ideas and philosophies in yoga that had always intrigued her and that she saw permeated throughout the yoga world. She connected with the physical practice, the meditation, and a community that was nurturing and vibrant. Kelly began spending her time studying these philosophies and asanas, training one-on-one with a yoga teacher and eventually leading her own practice. Today, she is the proud owner of Mission Yoga in Charleston, S.C. and leads a diverse group of instructors and students who together seek the renewal and inner peace that yoga can uncover. Kelly’s study of yoga, philosophy, and meditation led her to develop a unique practice called Sarayana Yoga, a blend of different styles of movement that support the higher aims of yoga as a whole. Sarayana is the path to uncover our essence, awakening to our full potential and our innate perfect selves. It uses three universal concepts of alignment, energetics, and psychology – represented as Ground, Center, and Sky – to allow us to view our whole lives as yoga (you can learn more about this at kellyjeanmoore.com). In July, 2015, Kelly led a Sarayana Yoga Retreat at Florblanca. Options for hosting yoga retreats abound in our area of Costa Rica but Kelly pulled together a small group of yoga and travel enthusiasts ready to experience a holistic retreat that would spark this essence of living through yoga inside and out. For that, Florblanca was just the place. Travel to Santa Teresa and Florblanca was made seamless by the efforts of the Florblanca staff, but was also adventurous and exciting. Private villas for each of the guests were sanctuaries for peace and calm. The food was beautiful, indulgent, and nourishing. The beach and the ocean were an endless source of energy and inspiration. And the yoga shala served as the communal point of connection and balance sought through meditation and asana practice each day of the retreat. As a haven of beauty and simplicity balanced with luxurious service and accommodations, Florblanca embodies the very spirit of a yoga retreat. Kelly took her students on a journey through Sarayana Yoga to awaken their passion and to transport that passion back into the world. Real change was made, real renewal and rebirth. And a remembrance that we are already perfect.